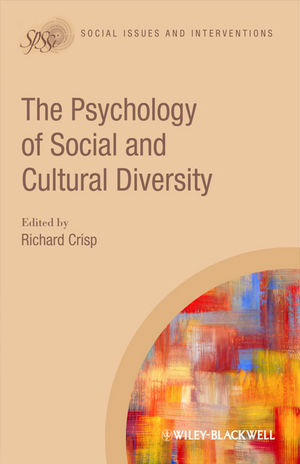 Promoting a scholarly understanding of the psychology of social and cultural diversity in the early stages of 21st century, this volume encourages an in-depth appreciation of the value in diversity while directly addressing social intervention and policy implications. Richard J. Crisp is Professor of Psychology in the Centre for the Study of Group Processes at the University of Kent. He has received numerous awards including the British Psychological Society's Spearman Medal (2006). He is joint editor of Multiple Social Categorization (with Miles Hewstone, 2006) and Essential Social Psychology (with Rhiannon Turner, 2007). He is associate editor of the Journal of Experimental Social Psychology and in 2009 was elected an Academician of the Academy of Social Sciences. 1. Introduction (Richard J. Crisp, University of Kent). 2 : Social identity complexity and acceptance of diversity (Marilynn B. Brewer). 3: Facilitating the development and integration of multiple social identities: The case of immigrants in Québec (Catherine E. Amiot and Roxane de la Sablonnière). 4: Costs and benefits of switching among multiple social identities (Margaret Shih, Diana T. Sanchez and Geoffrey C. Ho). 5: Multicultural identity: What it is and why it matters (Angela-Minh,Tu D. Nguyen and Verónica Benet-Martínez). 6: What I know in my mind and where my heart belongs: Multicultural identity negotiation and its cognitive consequences (Carmit T. Tadmor, Sun No, Ying-yi Hong and Chi-yue Chiu). 7: Multiculturalism and tolerance: An intergroup perspective (Maykel Verkuyten). 8: Diversity experiences and intergroup attitudes (Christopher L. Aberson). 9: The effects of crossed-categorizations in intergroup interaction (Norman Miller, Marija Spanovic, and Douglas Stenstrom). 10: Complexity of superordinate self-categories and ingroup projection (Sven Waldzus). 11: The categorization-elaboration model of work group diversity: Wielding the double-edged sword (Daan van Knippenberg and Wendy P. van Ginkel). 12: Divided we fall, or united we stand? How identity processes affect faultline perceptions and the functioning of diverse teams (Floor A. Rink and Karen A. Jehn). 13: Combined effects of intergroup contact and multiple categorization: Consequences for intergroup attitudes in diverse social contexts (Katharina Schmid and Miles Hewstone). 14: The application of diversity-based interventions to policy and practice (Lindsey Cameron and Rhiannon N. Turner).